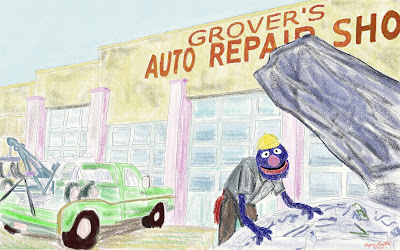 Introducing the completed third work in the Blue Collar Muppets series. It's been a while since I've been at it. To be honest, I got a new tabletPC (HP Elite Book) and it is the perfect size for digging into digital art again. The previous one was so huge it just wasn't fun. Okay, I admit that I get hooked on a random kids show every once in a while. I'm still mad that DirecTV does not add the Baby network to the regular line up. I'd probably watch that as often as I watch QVC or the Home Shopping Network selling knives, art, gems, or Esteban's guitars. So, what show has my interest now? 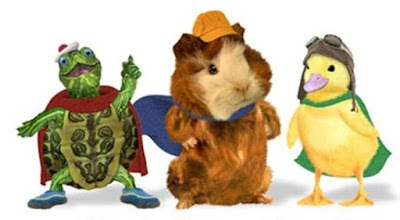 It's The Wonder Pets!, a new show on the Noggin channel. The animation is actually photo-motion stuff - which might come across as cheap. However, the voices and the music completely make up for it. Each episode is like an operetta. Seriously. 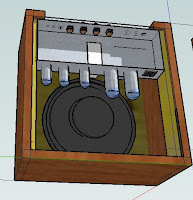 I am considering a push-pull amp for a small combo I want to build. 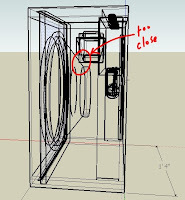 I want to make a tight build, so I mocked some stuff together in Google Sketchup first. So far I think I like the way it might look. This is a small combo amp, only 16" by 16" by 8-1/2" deep. I think it might work with a 10" speaker. I tried to see if a 12" speaker would work but the cage would be hitting the transformers, or be so tight that heat would be a problem. So, I shrunk the speaker size back to 10" and it looks like there is more than enough room for any buildup of heat and clearance for all components. I am thinking of using an Eminence Lil'Buddy speaker for this. I think the "bud" part is a joke because the cone is made from hemp. I've heard good things about the Cannabis Rex speaker, but that is a 12" model. Maybe it will be full, clear, and punchy enough. Basically I want something small enough so that I can take it out of the house (in one hand, guitar in the other). I have this delusion that I'll get some kind of invitation and I won't have a simple amp to take without planning and taking apart a head and speaker cab setup. I used Sketchup for another build, but I didn't go into much detail. But, because I almost ran into an issue on that build with the placement of the transformers, I put some effort into putting most of the components on the chassis that would stick out and interfere with things like the speaker. 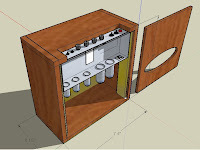 I haven't built an amp with the chassis in a transverse arrangement like this (tubes facing down), so that would be an interesting challenge. It seems like everything will be fine except for the heat. Maybe I should put a vent or two on the top. This will be an open-back design, so maybe there will be enough ventilation so that the tubes and transformers don't heat up the cone too much (or warp the cabinet or something). I am really thinking about covering this amp with tweed (even though it is not a Fender Deluxe, I sure like that look). I'm also thinking about using 3/4" pine stock, but routing fluting lines from the inside to shave a few ounces off. I think there would still be more than enough strength. This will be my first push-pull build. This means there will be to power tubes and a more efficient amplification scheme. I've heard they can be quieter too, especially with negative feedback suppressing extraneous noise. The downside might a loss of the even-order creamy harmonics that single-ended designs can do. I guess I will just have to build one and see, because I don't own any PP amps and I don't spend much time in guitar stores trying amps or guitars out. I just scored a 2003 Gibson ES-165 on eBay. This picture, without the flash, would have been awesome if it wasn't for my son's shoes and some bag in the background. Oh well, I take horrid pictures. I actually bought this guitar on August 22 (for $1,401.87). It took a month to ship from Canada (not the seller's fault - it sat in US Customs in Michigan for three weeks). I guess Customs finally figured out that a used guitar made in Memphis, TN doesn't need to pay duty. As for the odd dollar/cents amount on that price - that was my fault. If I am bidding against other people I end up sticking weird amounts on there. I don't know if it actually helps me to win (but it did beat a $1,400 even bid) - but I think it helps in the psych-out factor. Even with the $125 shipping, I still think this was a bargain. I spent some time this morning setting this guitar up. I'm not sure what was going on with the setup - but I think this guitar was set-up for a rocker or something. There was a lot of relief in the neck - it took me three days to adjust (tighten) the truss rod (I'm thinking three whole turns of that nut). I might have a little more tweaking to do, but the fretboard is pretty flat now. (I may set it up with no relief, like my Les Paul, or with 0.0015" at the 8th fret like my acoustic). This took care of almost all the buzzing and issues on the high frets so I could lower the bridge to a reasonable height. I also put some Tomastik-Infeld flatwounds on (elevens). The guy at a guitar store kept trying to talk me out of these ($20 per set!) and into some round-wound strings. I bought both worrying that he might be right and I won't like the more dull-wooden sound of the flatwounds. But, I love them. There were some issues with the strings that came with the guitar (besides being rusted) that had me concerned, but all is fine now. I also polished and cleaned this thing up. I am not a guitar cleaner really, since I always keep them in cases they stay clean. It was nice, though, to have a fresh start here. In case you're getting jealous - it took me three years to save up for this guitar. Most of the cash that I had set aside for this went to a transmission in early August. So, I put together what I had left and this auction fell into my lap. Since I plan on modifying this guitar a little bit, I don't mind that it is used (all my electrics were bought used). I have to admit that I really like the mother of pearl holly inlay here. The earlier models didn't have this (or MOP at all for the name!) - so I wanted a 2002 or later guitar. I saw Herb Ellis play once. He was playing his one-pickup ES-175 at the Lionel Hampton Jazz Festival in 1995. It was a brilliant performance. That guy is so classy. I already have a rosewood bridge on order (rather than the ABR-style that is on wooden feet right now). Not only does that look more classic, but I think it balances the tone better. I am also thinking of removing the floating humbucker and installing a pickup in the body (yes, that means cutting it). I am thinking about Seymour Duncan's copy of the dogear P90, but in the stacked (noiseless) version. I tried a few 1950s ES-125 with wooden saddles and P90s and they sounded absolutely awesome. Having something like this in a humbucking version would be thrilling. Well, here is the completed project. Some of the thread-lock solution is visible on this (the blue stuff) - but I think it is water soluble and should eventually come off. So, I never really described this thing, so here goes. This effects pedal is a clone of the Ibanez TS-9 and TS-808 Tube Screamer - an overdrive effect. This is not a distortion box, but there is some distortion and clipping that goes on. It adds enough gain to drive the preamp stage of the amplifier into a higher gain area so that it starts to break up, clip, and get that warm overdriven sound. It tends to accentuate the midrange quite a bit, adding to the warmth and smoothness that is often desired. I can also hear the difference between the 808 (a little more raw) and the TS-9 (more smoothed out, I think) settings. I don't know if I care that I can get half-and-half between them. Playing through this is the first effects pedal I have used in years. I am used to playing a more cleaner sound, or relying on the amp for overdrive/bite. This lets me do that at a somewhat lower volume which is great - it also has that cool mid-rangey SRV sound that I like with single-coil pickups through these things. I haven't tried it with my Les Paul yet. I can hear more noise when this thing is switched on (and the true-bypass works - so it is noiseless when off). This might be typical behavior but since I am used to noiseless pickups and my own amplifier builds - I don't like any noise. 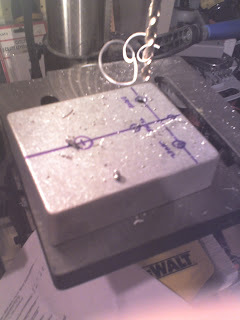 In the next build, I will see if shielding the runs between the pots and the board helps. I will definitely build another one (I already have the parts). I think "Bob Saget" came out reasonably recognizeable. I kept sketching him in pencil over and over again and I wasn't getting it right. I just crossed my fingers and did it and it is passable for me. I hurried through the other lettering on this thing, though, and it shows. I also could have laid out the switches a bit better - they aren't lined up too well. I forgot that this thing was going to have a battery before I drilled the footswitch hole. I would have liked to put that thing under that location a bit and it changed the location of the circuit board and the switches. I also did not measure how much of the pot shafts I needed to cut before I wired this thing up. I was cutting, grinding, and filing them afterwards with the cuts of this thing in my hand. (I guess I could have unsoldered them completely but I was being too lazy for that. I am glad I got this larger chassis to build this thing in. My mistakes in layout would have ruined the build. Luckily, I have everything in there and it is fine. One more mistake - I used solid core hookup wire and not stranded. I don't know why I did that, but now that it is made it's fine. If I had to do a lot of debugging (it worked 100% the first time I tried it), then moving things around a lot with solid wire might have caused a problem (stranded is more flexible and forgiving in this area). Next to the power and preamp tubes are some plastic goats that we screwed in through the chassis. Tyler said that this was very important. The goat theme has received praise as well. I guess it is the little things that matter. You can also see the massive power transformer in the background. 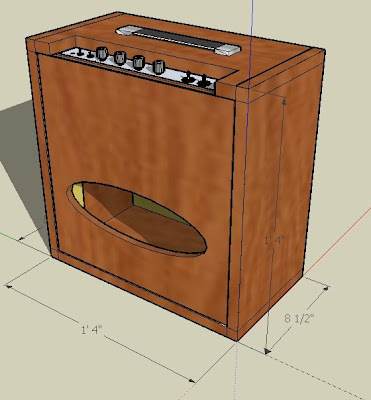 Since the amp has speaker jacks for the 4-8-16 ohm taps so we build the speaker cabinet to be just as versatile. The switch will select each speaker separately (8 ohms), or both speakers in parallel (4-ohms) or in series (16-ohms). Most of the time I like the sound of both speakers in series. But, to make things quieter, 1 speaker is good sometimes. He really wanted Mystery Science Theater 3000 to be on this amp somewhere, and right here in the back corner seemed the right place. That took a lot of ink to fill that area in! I like this even more than the goats! It's a nice tag at the end of a great project. 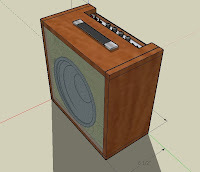 This is the final product, speaker cabinet with the amp. The speaker cab is a 2x12 open back. The two 12" speakers are Eminence ToneSpotters (from their Redcoat, or British-sounding series). This thing, even at a modest 11-12 watts, can get very loud. This speaker cabinet is up in Tyler's room. The amp head can move between that speaker cab and a closed-back 2x10 that I built. I'm going to be honest and say that I don't like the sound of this cabinet really. I am going to give it some time, maybe when the speakers break in a little I might like it more. It may be the speakers, or it may be the closed-back design. It is more focused (directional), and definitely not as loud as an open-back design. If I still don't like it after a few months I don't know if I should change the speakers or cut a big hole in the back to make it an open-cab. Below is the final picture of this build, with Tyler enjoying the fruit of his labor over several months. 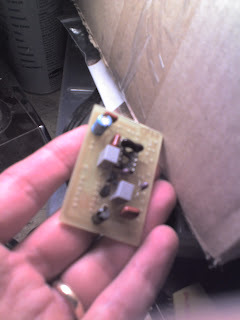 Here's the part that I said was harder than building a tube amp - the size! 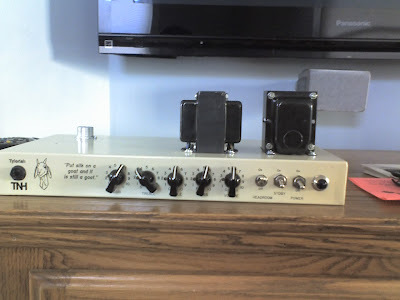 This little chassis (the size is called BB) will have three knobs, a foot switch, a power indicator, an input jack, output jack, external power supply, and three switches (popular mods to the TubeScreamer model). Oh, and I almost forgot that I need room for a battery on the inside! This is not as many holes as an amp chassis - but I bet the number of holes per surface area is more than double that of a tube amp! 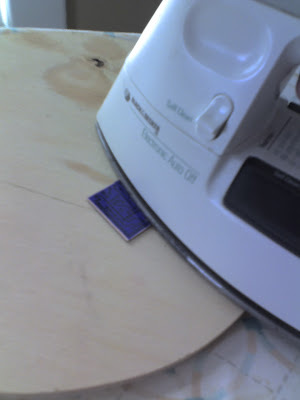 Since everything is so cramped, I would drill a few holes, load up the components, test things for fit, and then remove everything to drill a few holes. I really love drilling out this kind of stuff. Knowing that the controls will be exactly where I put them requiring a lot of layout is a fun challenge. 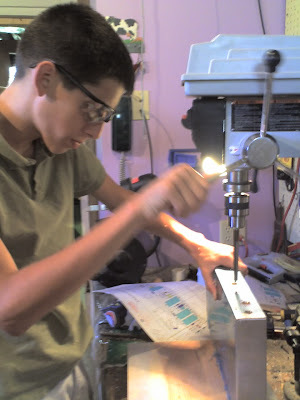 Besides, I never took metal shop in the eighth grade like the other guys (I think I took Spanish I). Here's making up for lost time! I had to change my soldering iron to a needle-like tip for this close work. I think the next time I do this I will get one of those hobby items that has a magnifyng glass and something to hold your work up - I can definitely feel my eyes getting older doing this kind of close work. 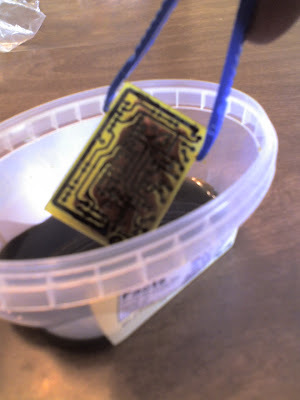 To do this part, you feed a component up from the top, and solder it here on the back. It's pretty straight forward (unless you lose yourself, which only happened 2-3 times). 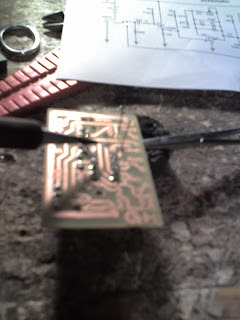 This probably took about 30 minutes to populate the circuit board - not too bad. Okay, this looks horrible, and is a little deceiving. 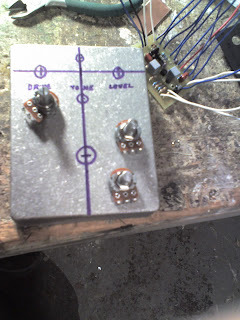 I built this fx pedal before I painted it (not what I do with tube amps). I guess I wanted to know if this thing actually worked before I spent time painting up a fancy box before chucking the whole project in the trash (and never blogging about it!). So, I had a working effects pedal and then took it apart to paint it. This is all the components taken out of the chassis and it gives the false illusion that I built it this way. This is close work, and hard (but not that hard!). 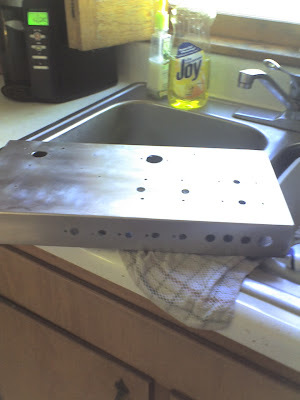 Here is the the chassis after being primed and painted with a flat white. As you can see, I have decided on a Bob Saget theme for this little guy. I am planning to give this one to my son after I'm done so he will be stuck with God's gift to comedy permanently adorned to his TubeScreamer. Of course, I have already tested this thing and it sounds absolutely awesome. So, I don't think he will mind. 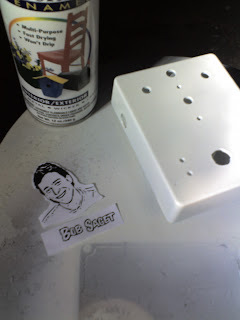 Drawing Bob Saget from my template may be a challenge. My first attempt on scratch paper looked like a young Bill Clinton. I will then build a second one, after I work out the layout kinks. Of course I will need to pick another celebrity or image for that build. I got it in my head that I wanted to build a tubescreamer foot pedal. I used a layout and schematic found on TonePad.com. 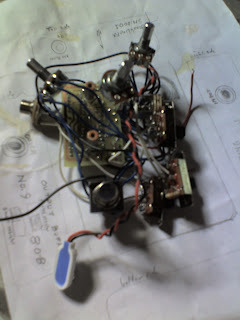 I have heard that someone should attempt to build an FX pedal before attempting a guitar amplifier. I'm not sure that I agree with that. Sure, the build is faster, but everything is so tiny! 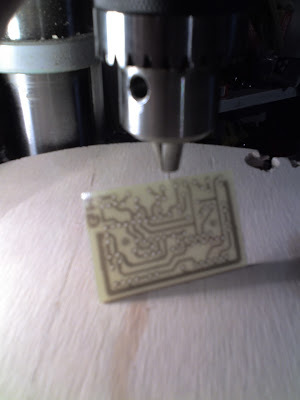 I have never messed with circuit boards, and definitely have never etched anything. So, this was all pretty new to me. But, what better way to learn than to just dive in and do it. I bought most of the stuff from Mouser and Small Bear Electronics. I get most of my electronics stuff from Mouser, but Small Bear did have more reasonable shipping costs for such a small order. Of course, it wasn't too small of an order because I ordered enough to make two, bought some etching supplies, and two high-quality pliers. 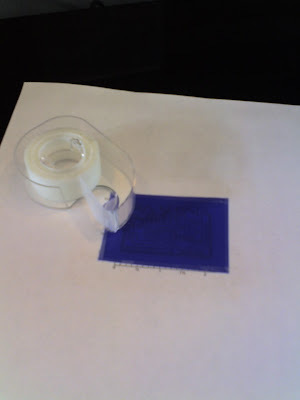 The weird looking blue stuff that I taped to a piece of paper and printed on is called Press-n-Peel. Using the clothes-iron, I am affixing the image that I printed (borrowed from Tonepad, but heavily edited and re-done in Illustrator). I cut the board first. 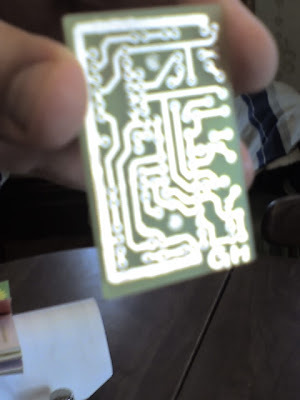 It is a fiberglass circuit board with a layer of copper on it. The idea is to cover the traces with toner (and fill in any planks with a Sharpie or other pen). Then, etch all the other copper away. I'm going to be honest and mention that I did not get a good transfer on the edges. I read about 5-6 tutorials on this and they all mentioned that the edges were the hardest part. Luckily, I was able to draw back what was missing. 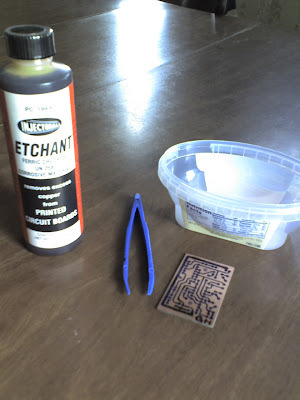 Here you can see the board about to be etched with a bottle of etchant (ferric chloride). 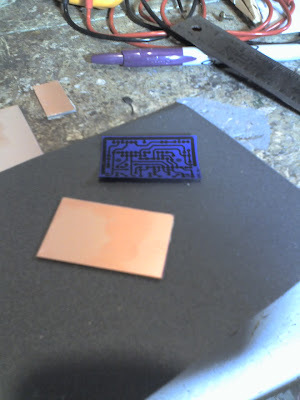 By placing the board into a small amount of the etchant and gently rocking it for about 15-20 minutes, all the copper that you don't want is removed. The plastic tub is nothing special, the etchant doesn't bother it any. I had visions of the ferric chloride eating the entire thing up (including the fiberglass, lol) and having to start over. As it turns out, this part of the process is just as easy as described. Except for the waiting part - that was a little brutal. Here about 1/2 of the copper has been removed. The traces are protected by the material that the Press-n-Peel left behind (and my pen marks). Apparently this ferric chloride can really stain your hands and rubber gloves are recommended. I didn't do this, but lucked out somehow. The copper etches off from the outside in, so the center part of this board still has a bit of copper all over. The edges are etched perfectly up to the traces. This process really did take the full 20 minutes or so. But, eventually the board was etched and I ran it under cool water for a while to stop the etching process. Next, a tiny drill bit was used to drill the holes that the component leads will fit through. Before I etched the board, I did make sure that the components would fit (which is why I re-made my own board layout entirely in Adobe Illustrator). Some of the items just didn't fit right, and I moved some of the things around. This little drill bit looks like something a jeweler would use, I was afraid I would snap it off. This is such a horrible out-of-focus picture, but here is the finished product. The traces worked perfectly (and I double-checked continuity on quite a few of them with the multimeter). This is easily 1/3 done at this stage. The next step is to start populating the circuit board with components. Here is the front panel, all inked up. I have blogged on this process before (Mr. French, and HNB) - but basically I am just using the old pen-and-ink technology with Leroy lettering tools. TNH are my son's initials, and it is an homage to the HNB, (based on his grandfather's initials). They share a middle name. "Put silk on a goat and it is still a goat." This picture looks pretty good, but there are some issues with the finish. He really wanted something that was more of an off-white, and an ivory spray paint looked great. However, the store did not have this in a flat finish and I thought that satin would be fine to hold up to the lettering. Well, it did, perfectly. However, there must be something in the satin part of the finish that interacted with the lacquer clear-coat. We got some orange peel going on. 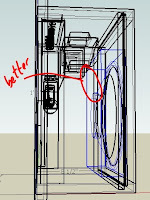 A bad spot is on the side, and it will be hidden in the cabinet. Another bad spot is on the top, mostly under the output transformer. As things go, that's not so bad either. There's a small spot on the back, near some wording, that does look more on the obvious side. However, I'm looking at it right now, from across the room, and it looks fantastic. The controls and transformers aren't hooked up to anything, the guts are empty. Next step, preparing the turret board. P.S. The GAIN and master VOLUME go to 11. 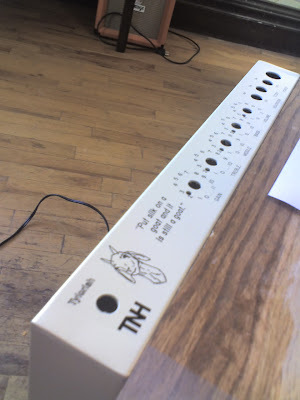 ...maybe it was just the school year, and the home renovation, and spring/summer yard/garden work - but we FINALLY got back to working on the TNH amp. My goal is to finish it before August 1 - because that will be 1 year! Today we began by drilling the chassis. I like to use a standard Hammond 2x8x16 aluminum chassis. The aluminum drills well and takes paint (and Bondo) well. We counted that this simple piece of metal will have 51 holes in it! That's a lot of drilling. Of course, every hole needs to be double checked with the parts to see that they are the right diameter. All of the holes are circular, drilled, except for the mains power entry. That has to be an odd shape to accept the IEC power connector (that's the style that you find on the back of some appliances like computers). I like IEC connectors, but it is a pain to use nibblers to nip the metal out little by little. Here is the chassis with every hole punched in it. The two big ones on the top are for the preamp and output tube mounts. I have to use a unibit (stepper) because they are so huge (the largest one is a full inch). I've heard of some people doing this with hand-drills and spade bits and it's incredible that they have success. Nothing makes amp building nicer than the $99 drill press that we use. We used dish soap to get it cleaned up, and put some Bondo (car repair filler) in some of the corners to make the chassis look more consistent. When it is painted up, it will look nice. I'm getting excited about lettering this amp, it should be fun.